As talk grows of Greece restructuring its debt, it is important to take a look at who really holds Greek debt and who will be affected by a potential restructuring. At the end of 2010, the Ministry of Finance (MOF) reported that the Greek government had an outstanding public debt of €340 billion, of which €286 billion was in the form of bonds and short-term notes and €54 billion in the form of loans (see here). Dissecting who holds that debt, however, is a murky exercise. Below is my effort to reconcile the numbers – these are estimates at best and I hope to revisit these numbers as better information becomes available (the graph shows Q3 2010 because that is the last date for which all data is reported). 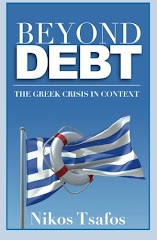 The main source for separating domestic versus foreign debt is the Bank of Greece (BoG). The BoG reports the country’s International Investment Position (IIP), which is effectively the country’s assets versus its liabilities (here). At the end of 2010, the BoG reported external liabilities for the General Government of €149 billion (lines 2.2.2.1 + 2.2.2.2). There is also the debt to the Troika under the bail-out plan, which at the end of 2010 was valued at €40 billion (line 4.2.2.3 in the IIP, which also covers some other small liabilities). There is another tranche, which is less clear cut: bank borrowing from the European Central Bank (ECB). Greek banks borrow from the BoG by posting collateral, including Greek government securities or loans; in turn, the BoG borrows from the ECB. Since these assets remain on Greek banks’ balance sheet, we can classify them as domestic liabilities. 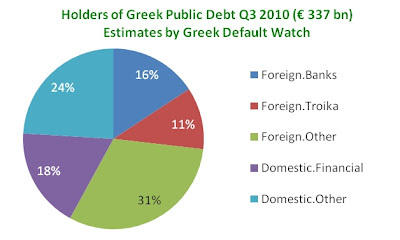 Therefore, foreign ownership of Greek debt equals €149 billion + €40 billion = €189 billion, or 56% of total government debt. The Bank for International Settlements (BIS) publishes data on bank holdings of Greek public sector assets. 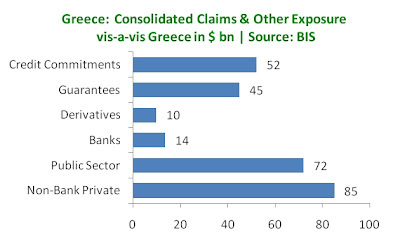 So far, the BIS has only published data to Q3 2010, at which time foreign banks reported an ultimate exposure of $71 billion to public sector assets in Greece – or €53 billion (16% of total Greek public debt). The rest of Greek debt held abroad, therefore, belonged to non banks. Looking at bank claims on the Greek economy, however, it is important to recognize that exposure to the public sector made up just 42% of the total. Exposure to banks was just 8%, while the rest was to the non-bank private sector (50%). Foreign banks also have exposures, comprising of ~$110 billion in derivatives, guarantees extended and credit commitments. If we add these to foreign claims, Greek government debt made up 26% of the total. Foreign banks, therefore, stand to lose more from the ripple effects of a default than from the mere write-down of Greek debt. Domestic: The BoG publishes the Financial Soundness Indicators for Greek credit institutions, which measures, among others, the holdings of Greek securities and loans. At the end of 2010, these amounted to €63 billion, or 12.6% of total assets, which is important but not extreme, leaving €80 billion in the hands of non-credit domestic entities. 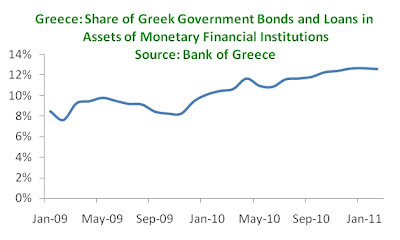 Although exposure by credit institutions has remained fairly constant since July 2010, given the deteriorating position of Greek banks (see here), government assets form an increasing share of the overall portfolio: from 8.5% in January 2009 to 10% in January 2010 and 12.7% in January 2011. Any restructuring would have an increasingly significant impact on Greek banks. So what does all this mean? At a high level, bank impairment is less of a risk than the overall balance sheet deterioration that would result from a default. 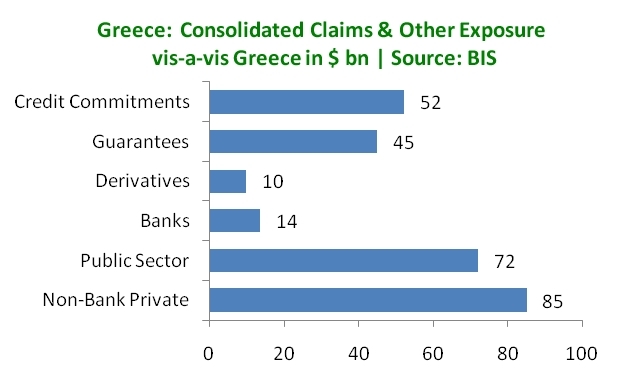 In the foreign sector, claims on Greek government debt are important, but they are only a fourth of overall claims and other exposures on the Greek economy. Importantly, credit to the non-banking private sector is bigger than ownership of government securities. In the domestic economy, government securities and loans form an ever increasing share of total assets for local banks, and they also form a main pillar of banks’ borrowing strategy. To put these numbers in context, the Greek banking sector has lost €26 billion in deposits since December 2009 – so a €63 billion write-down, even partial, would be big. Even so the non-banking sector would suffer even greater losses, further impairing the balance sheets of households, corporations and other institutions. good work. Looks to me like a default / restructuring would require a recap of all Greek Banks, not even National Bank of Greece can get away without one, even post their cap raise. I spent four hours looking for the information you have posted here...Thanks!!! Wow , Its really incredible what is happening now in greece , Everyone hope greece get better as soon as they can.